I love you. In all my paleo explorations and experiments with decreasing grain and gluten consumption, I forgot just how wonderful you can be, especially for a pescetarian like me. Robust. Delicious. Crunchy. Sweet. Filling. Fibrous. I could go on for days. I’m so happy to have you in my life again. Okay, in all seriousness, here’s my thought process. Rolled oats, in pure form, are gluten-free. Now, with the state of most growing, harvesting, manufacturing, and processing practices, conventional rolled oats will NOT be 100% gluten-free. 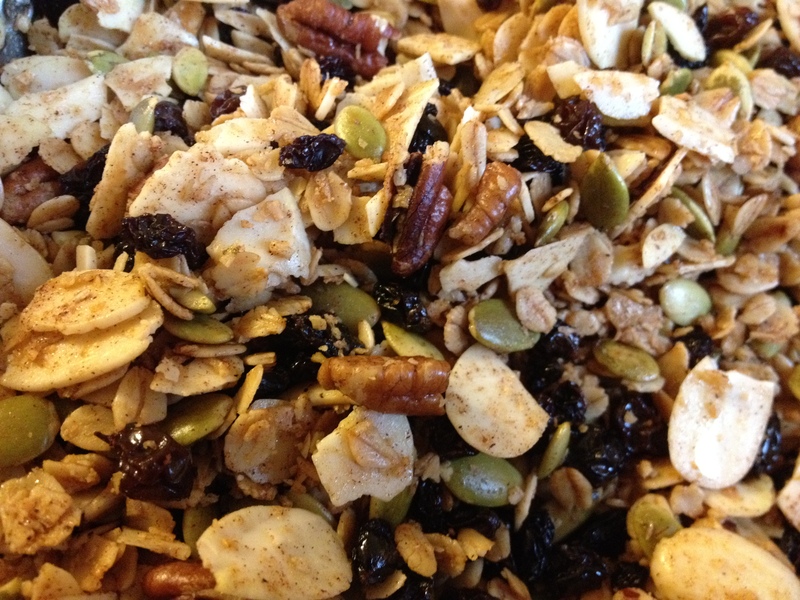 So, if you have celiac disease, an extreme gluten intolerance, and/or you don’t want any gluten in your life, you have two options here: make the granola recipe below paleo-style by excluding the oats OR buy certified gluten-free oats. Bob’s Red Mill sells them both online and in various grocery and health food stores. Preheat your oven. You have two choices here. Slow & low or high & crisp. You can choose to either bake the granola at 250 degrees for about 75 minutes or pump the heat up to 325 degrees and and bake for more like 20-30 minutes. I’ve liked the lower heat so far, but a higher heat with less cooking time would give you a more burnt/crisp granola — and it obviously takes less time. Combine all the dry ingredients above into a nice, big bowl. Add the spices in last. Of the three, cinnamon should be the most prominent, up to able a tablespoon worth. I don’t measure it. Just shake it on there and mix it up until everything looks well coated. Then toss in some nutmeg and cloves. More like a 1/2 teaspoon of each, as they can be a bit stronger and overpower the mix. Then, combine the oil, honey, and maple syrup in a separate bowl or measuring cup. Make sure the oil is liquified — you might need to microwave or heat it up a little bit to achieve that consistency. Add in the salt and then mix it all together with a wire whisk until you get a thick, sweet-smelling, golden-colored paste. Drizzle the sweet oil mixture into the bowl of dry ingredients and stir until well-coated. 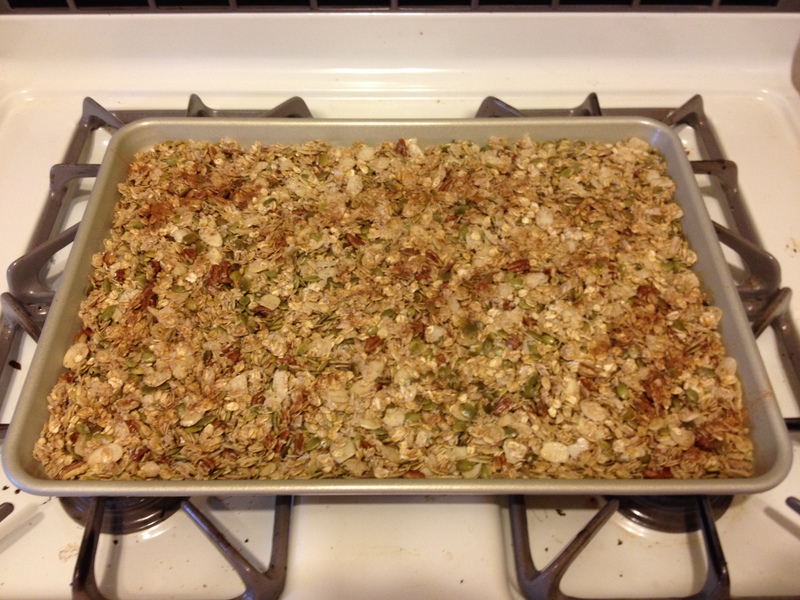 Next, simply lay the granola out onto a non-stick baking sheet (or a regular baking sheet with parchment paper on top). Throw it in your oven and wait for the magic to ensue. I like to take the granola out at least once or twice and stir/mix it up so it bakes evenly. When finished, take the sheet out, let it cool briefly, and then pour it back into your mixing bowl. Add in your dried fruit and mix again. The final step? Try not to eat the entire bowl of freshly baked, warm granola sitting in your kitchen. I recommend walking away after a few taste tests. Bottle that goodness up and keep it on your shelf to eat throughout the week and/or to share with friends if you’re feeling generous. -With a spoon, directly after baking, warm from the mixing bowl. Yum. -With almond milk as a light breakfast or bedtime snack. -In a parfait: mix greek yogurt, homemade granola, sliced bananas, and any other extra additions you like (hemp seeds, chia seeds, flaxmeal, etc.). Enjoy as a sustaining breakfast or a big mid-day snack. Post any ideas, questions, or variations to comments!